Yellowstone Holiday provides a uniquely beautiful experience for visitors to Yellowstone National Park. 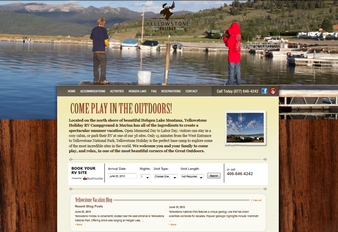 Situated on picturesque Hebgen Lake, Yellowstone Holiday offers quaint cottages and cabins, as well as spacious RV parking for park visitors. In addition to the excellent fishing, water sports, volleyball, tetherball and horseshoes, visitors can saddle up at one of the area’s horseback riding ranches and head out on a scenic mountain trail. Guests can take a relaxing drive around Quake Lake, created in 1959 by the strongest earthquake recorded in Montana history or visit historic Virginia City, an Old West gold mining town “frozen in time.” From white-water rafting and world-class fishing to museums and IMAX theatres, Yellowstone Holiday wants to make sure guests’ Yellowstone Holiday vacation is unforgettable. Located in Salt Lake City, Utah, Adaptivity Pro provides exceptional web design and Internet marketing services throughout the U.S.
Eric Morgan, who serves as president and CEO, oversees every aspect of his business with his keen eye for detail. Mr. Morgan employs a team of professional web designers, programmers and writers to give each client an excellent value for their marketing and web design investments. Adaptivity Pro offers a wide range of services, including SEO, PPC, web design, Internet and social media marketing.